I've flown over the Channel Country several times, and mostly it's been dry or only small waterholes. And I wasn't disappointed! This was the Thompson River this year. Of Of course the road traffic has problems, so a 'high clearance' vehicle is the way to go! And this is Cooper Creek 2009 - it really is 'Water Everywhere'. Much of that slow-flowing water will soak into the soil, and the rest will flow on towards Lake Eyre. Some of the country is already greening up. And this is some of the beef that's growing here. That's a lot of beef right there, and the best eating beef of all - real 'red meat', so much leaner and tastier than that soft, fatty, grain-fed stuff. And healthier as well, with less fat and absolutely no antibiotics or chemicals. Only problem is how to catch them in that wild country..... That's an adventure in itself, with the help of helicopters when the country dries out. A pattern of channels and oil/gas exploration seismic lines. There's an old saying, "... Join a seismic crew and see the swamps and deserts of the world up close ...". The creek is already flowing strongly, and all that water upstream is still to come. 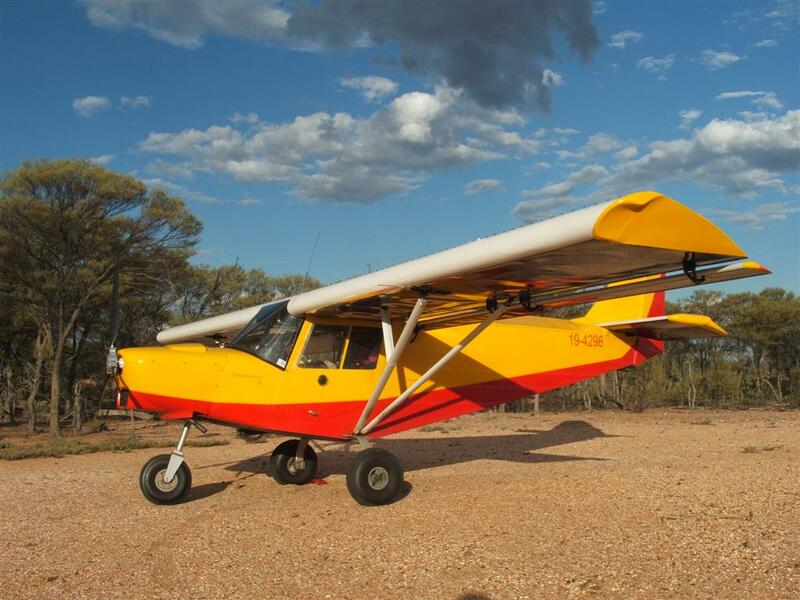 I didn't get to Lake Eyre this trip; the above photo was taken by Tim and and Dave while ferrying another Savannah that Tim had bought, from South Australia to Queensland. Here's Dave and Tim at Mungerannie airstrip, along the Birdsville Track. As I was coming into the Dig Tree, I heard them on the radio calling into Innaminka, then met up with them at Thargomindah where we both stopped for fuel. They were having a great adventure on their long x-country flight! This is different country altogether. It's irrigated cropping, mostly cotton, near St George, Qld. Lots of water storage on farm. I'm sure glad that I made the effort to get out there and have a look. I didn't have much time to spare, so this was just a three day trip. 8 hours out on the first day, and camped on a remote disused airstrip that I know of. One day to look around the Channels, and camped at the Dig Tree. Then another long day home. A short time away and a lot of flying time and fuel, but well worth the effort to see this country at flood time. These little aircraft are so good for such adventures! Yes, it was hot this time of year, 40+C, and millions of pesky bush flies all day.... Still 35 degrees at night, with lots of mosquitoes so had to sleep in the tent, which was like a sauna ...... Very uncomfortable at times, but worth it by far for the adventure!! !